There is a whole lot to be said about the convenience that is to be experienced with mobile wagering. What it does, in effect, is take the online games that are played in a casino, as we know them, and bring them to life on a mobile device. In many cases this is by way of a smartphone, which can be held in the palm of a hand, and can also be realized with a tablet, such as an iPad, which can be carried very, very easily. It should be no surprise, then, that there is a transition that is taking place, where more and more people who had been playing poker online are doing so through the mobile outlet of their choice. And so that is the next logical point of concentration for digital gaming operators who want to stay on top of the latest in what is going on. When you talk about operators, there are very few who are bigger than PartyPoker, which is one of the pioneers of the industry, and so when they speak, people would do best to listen. What they are saying is that, at the very least, one-quarter of all poker wagering will be done on a mobile device by the end of the calendar year of 2014. That is essentially a little over a year from now, and that, of course, represents massive progress. They also say that the number might even be higher than that - as much as 30%, possibly. PartyPoker has been delivering the product to the public for a long time, as it has been in business since 2001. It might be considered a "third-place contender" when compared to the giants of the industry such as PokerStars and Full Tilt Poker, but they are very formidable nonetheless. And it has plenty of credible partners, such as the World Poker Tour. 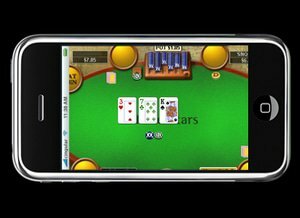 Along the way, the decision was made to move hard into mobile poker, first through an Android app, then with an app that could be used on iPhones and iPads. With that, they had a considerable share of the market covered. Although it is the same game, and essentially the same culture, the opinion of Jeffrey Haas, PartyPoker's head of poker operations, who spearheaded the movement toward mobile, is that the mobile player has a different approach, almost by necessity, in that he or she has to navigate through the kind of distractions, out in public much of the time, that don't really affect someone who is sitting at a computer. This has an effect, in that while they may play for shorter periods of time, they also tend to wager more on a bet-by-bet basis. It is a matter of focus, according to Haas. But that does not mean that the trend toward mobile poker is going to dull any time soon; in fact, quite the contrary. Haas feels that after the climb into the 25%-30% range by the end of next year, there is going to be an increase every year thereafter, which means that playing the game of poker on a computer may someday become a thing of the past.